When you've committed to spending time posting on social media, you definitely want to know what's working! What should you be posting more of because it's driving a lot of engagement and sales? And what isn’t doing a whole lot? Lucky for you, Facebook has an incredibly robust reporting tool automatically built in! If you're posting on Facebook, you have access to all of the information you could possibly want or need! All you have to do is head to your Insights page, and use this helpful data to drive your strategy. Once you’re here, you will see a broad overview of the last 7 days on your page, and 16 additional options in the left navigation bar. But which of these truly matter and what should you pay attention too? If you've boosted any posts, the results will be here. If you've created any ads outside of boosted posts, you will need to look at them via Facebook's Ad Manager. Ad Manager will provide more information specific to ads, and we recommend reviewing all ads there. Here you will see your total page followers, net followers (new followers minus the number of unfollows), and where your page follows happen. While having a lot of followers is great, it is better to have a smaller, targeted and engaged audience than a larger uninterested one. This page is very similar to the followers page and the same rules apply! Here you will see your post reach, recommendations, engagement, reactions, and total reach. This will allow you to connect well performing content to different trends in your graphs. This page will show you how many people have viewed your page. You can break this down by section, age and gender, country, city, and device. This can give you a closer look into what audience is finding and visiting your page, and help give direction for what to post for them. This page is very similar to page views and the same rules apply! Here you will see total actions taken on your page, like website clicks and action buttons. You will also see the breakdown by click for multiple demographics. This will give you a breakdown of what time your audience is most likely to take an action. BY spends a lot of time on this page! You will see a breakdown of activity on each day and hour of the week. You will also see all published posts, with the type, reach and engagement. We like to utilize this page to find which day and time to schedule posts and also get a preview of which posts really driving engagement. If you host a lot of events (we're looking at you breweries! ), you will definitely want to review this page. You will be able to see all of your events, how many people you have reached, event responses and ticket clicks. You can also view this page directly from your top navigation bar. We love video at BY, and we hope you do too! On this page you will see video views, engagement and total minutes viewed. It will also show you all videos you have posted. We recommend using this information to build out your video strategy! If you utilize Facebook Stories, make sure you have turned on Stories Insights. Although stories disappear after 24 hours, you will be able to see them here for 28 days. Who is liking, following and being reached by your page? You'll see them here! This page has an in-depth look at the gender, location and language of your audience. 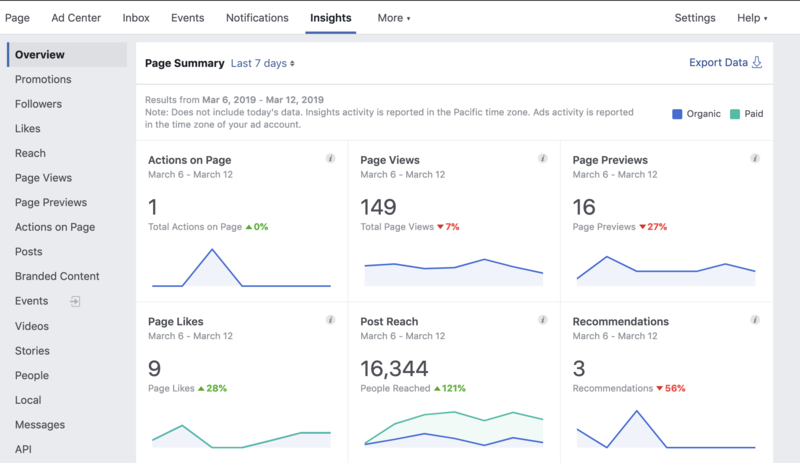 For an even deeper look, check out Facebook Audience Insights which will give you even more demographics (you do need to have an ad account in order to use this feature)! This is a unique page - you will need to request access from Facebook, and it will take a few days to receive. You will be able to learn about the people new you - like their activity and peak hours, demographics and whether they're seeing your ads. If your audience has questions or comments, they're probably messaging you! Here you will see how many messages you've received, your page responsiveness and if anyone has blocked you. Try to respond to messages quickly, as these people are usually warm leads! Wowza! That was a lot of information. But, now what? 1. Actually use this information!! Facebook is providing you with everything you could need to run a successful campaign - so do it! 2. This data is constantly changing - set a reminder to check on it. 3. Download your data, or use a reporting tool like Google Data Studio to visually see trends across the year. And if you're not sure exactly what to do, give Brand Yourself a call!